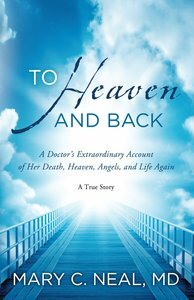 A doctor's account of her own experience of death, heaven and return to life with a new realization of her purpose on earth. Dr Mary Neal, an orthopaedic surgeon, was on a kayaking holiday in Chile. Sceptical of near death experiences, she was to have her life transformed when her kayak became wedged in rocks at the bottom of a waterfall and was underwater for so long that her heart stopped.To Heaven And Back is Mary's faith-enriching story of her spiritual journey, her first-hand experience of heaven and its continuing life-enhancing effects. About "To Heaven and Back"
Mary Neal is an orthopaedic surgeon. She studied at the University of California at Los Angeles School of Medicine, completed her orthopaedic residency at the University of Southern California and is fellowship trained as a spinal surgeon. She is the former Director of Spine Surgery at the University of Southern California and is a founding partner of Orthopedic Associates of Jackson Hole. Her after-life experience featured on national media in America. She has served as a church elder, on several non-profit organisation boards, and created the Willie Neal Environmental Awareness Fund. Dr Neal lives with her family in Jackson Hole, Wyoming. Customer Reviews For "To Heaven and Back"
I can recommend this book for several reasons. It was written by an apparent born again Christian. Her experience seemed to draw her into a closer relationship with the Lord and she shares some definitely Biblical instructions. A discerning Christian will always have some questions and queries come out of books of this type, including this one, but I don't think we need to "throw out the baby with the bath water" and say that they're all questionable, unreliable or unbiblical. A couple of things that others said to her (about their experience) raised questions in my mind. At the end of the book there are questions that people have asked her. They could easily be read first, without giving anything away and it may even be helpful, but if you look at the photos first, part of the story will be given away early. The book does not actually detail Heaven itself. She just touches on that. This book really spoke to me, a compelling true story that makes it hard to put down. I feel that this book will bring many people to christianity.